Aesthetic Realism & Wilfred Owen's Poem "Strange Meeting"
The landscape of American education looks very different than it did five or 10 years ago. Increasingly, the young people we meet in our classrooms feel that what they’re supposed to learn in school is miles away from what they are most concerned about—including their parents’ worry about money, uncertainty about their own future, and, more keenly than ever, the injustice and terror around the world and in our own nation. All too often, young people use this confusion to decide, even if unconsciously, that they are living in a messy, inimical world, and to mock the very idea of justice. As an educator who proudly used the Aesthetic Realism Teaching Method in my high school English classes for nearly 30 years, I see it as my happy, insistent obligation to show students not only that justice does exist, but that the very subjects we study in school can teach us how to see the world and other people justly. That way of seeing, I am grateful to be able to show them, is in art. All art, including the art of poetry, arises from the just, ethical way of seeing the world and people we all need to have. The Aesthetic Realism Method, which teachers at all levels have used with tremendous success for nearly four decades, is based on the philosophy founded by the great American poet, critic and educator Eli Siegel (1902-1978). It teaches: The purpose of education is to like the world through knowing it. Further, Aesthetic Realism teaches that reality can honestly be liked because it has a sensible, beautiful structure, described in the following principle: “The world, art, and self explain each other: each is the aesthetic oneness of opposites” (Siegel, Four Statements). This aesthetic structure is inherent in every aspect of the English curriculum—from the study of word origins to the understanding of a Shakespearean sonnet. Mr. Siegel also described the way of mind in every person that is most against justice: contempt—“the lessening of what is different from oneself as a means of self-increase as one sees it.” When a person has contempt, he or she is cold to the feelings of other people, and this is the beginning of all injustice, in personal life and on a massive international scale. As you talk about [people], do you think you sound kind or unkind? [Unkindness] has to be the result if we’re not really interested in how another person sees himself, and how that person is affected by the world. Aesthetic Realism explains that evil is not wanting to see the feelings of another person with as much depth as our own. Do you take the life out of people? I did, and I learned that this was why I felt so hard and lonely, and why I couldn’t be useful as I hoped to be. As I came to see that other people had the same depth I gave myself, I felt for the first time that I could be kind, and it was this feeling that made me want to become a teacher. Every person should be able to learn what stops us from being the people we want to be. One of the ugliest forms of contempt is racial prejudice. The need to understand it impelled the lesson I’ll be describing. There had been a violent racial attack near the high school where I was teaching; several African-American young men were viciously beaten by white teens. My students, mostly African-American and Latino, were understandably very angry, and I felt that, as a teacher and a person who is white, I had to talk about this subject honestly, in a way they could respect. I told them what I have learned: that in poetry, sameness and difference, opposites that fight so horribly in racial prejudice, don’t work against each other, don’t lessen each other, but rather, they add to each other and make for beauty. Art is the greatest opponent of contempt. According to Aesthetic Realism, poetry is a picture of reality at its truest, most useful. We look at reality, we look at it mostly in a contradictory way. It happens that our deepest desire is to make sense of the contrarieties in this world…We need to see reality as one thing, with discord present. We need this very much. Poetry meets this need. My students saw how this is true as we studied Wilfred Owen’s great poem of World War I, “Strange Meeting.” It has terror and beauty, and a large reason it is beautiful is the way it puts together sameness and difference, both in its literal meaning and in its structure and poetic music. And in one of the most moving lines in 20th century poetry, Owen musically merges sameness and difference, as he presents the horrible consequences of their being seen as against each other: “I am the enemy you killed, my friend.” Yet it is important to see that it is not only what this poem says that matters. 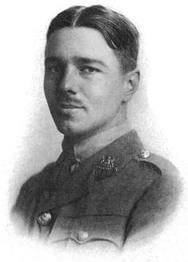 Wilfred Owen had a powerful emotion about the horror of WWI, but so did many, many other people. It is the form he gave that emotion that makes this poem so musical. In the structure of the poem itself, Owen has sameness and difference meet, join, and complete each other in a way that makes for beauty. We discussed one of the main ways he does this—through the use of assonance. In preparation for the study of this poem, my classes spoke about the cause of prejudice. “Does it begin with race?” I asked. Some thought it did, while many others, thinking about it further, said they didn’t think so. We spoke about how, in all forms of prejudice, there is contempt for what is different from oneself. This means there can be prejudice about anything, and my students gave many examples of how they saw this. One young man I’ll call Andre (the names of the students have been changed throughout the article) said that as a child he was prejudiced against certain foods, like spinach—and everyone in the class laughed with recognition of their own childhood food biases; Sean said teenagers are often prejudiced against their parents, because they’re older, and seem to have nothing in common with them. Silvia pointed out that people in different countries are often prejudiced against one another, because they don’t have the same kind of government or customs. We saw that it is the same feeling—contempt for what seems different from oneself—that makes people with different color skin, or who speak a different language, look at each other with superiority and suspicion on a New York subway or on the streets of any town we could name. As we spoke, everyone in the class realized he or she had had this feeling—that something or someone else was inferior, simply because it was different—and everyone was ashamed of it. We have to be. If we diminish the world, Aesthetic Realism explains, we diminish ourselves, too. Earlier, my students had been excited to see how sameness and difference are crucial in understanding every one of the technical aspects of poetry we had studied—including alliteration, simile, metaphor, rhyme, symbolism and others. As we spoke about “Strange Meeting,” we saw that assonance is a beautiful way sameness and difference are one in poetry. In his essay “Assonance Is Like This,” Eli Siegel gives this beginning description of assonance: “the using of the sameness and difference of sound in syllables for poetic music and, therefore, poetic effect” . Assonance is related to rhyme, because in both, there is a sameness of sound in words that are different. People have loved rhymes, such as “sleep” and “keep”, or “bright” and “night”; we talked about why. “Do you think rhyme does what we need to do,” I asked, “to see sameness in what is clearly different?” They felt it did. Reading aloud the final words in each line—”escaped” / “scooped”; “groined” / “groaned; “bestirred” / “stared”—I asked, “Which do you hear first, the similarity or the difference?” They felt they heard the difference first. Rhymes can be very beautiful, and some of the most enduringly grand poetry of the world has them, but I asked my students why they thought assonance was more fitting for this particular poem. Did they think it would have been more or less beautiful if Owen had used rhymes instead of assonance? They felt it would have been less beautiful, because the subject of the poem grapples, struggles with how people see each other. Further, because of the difference in vowels, the sound in the two words ending the two lines of each couplet also have opposite qualities, and this has us see even more meaning in the poem. “Groined,” for instance, has something sharp, in both its sound and its meaning, while “groaned” seems to spread inwardly with dull agony. Throughout the class, I was struck by how deeply the students listened to the poem, which is fairly difficult, and to each other. Charlene Carter described how her way of seeing difference changed when she met a relative who had grown up in the West Indies. “At first I didn’t like her. Everything about her was different: she dressed differently, spoke with a different accent, and ate different foods.” Then she described what happened as she learned more about her cousin. “I found out we both had a boyfriend, we liked some of the same singers, we both got upset sometimes, we were both good in math. I started to like her.” “Did you like her because she was both different from you and like you?” I asked. “Yes,” she said. I asked, “If people of different races felt they needed to see how much they are alike, and wanted to know and value their difference, too, would they have more feeling for each other? Do you think there would be occurrences like the racial attack that took place recently—and others that have terrified people all over the world?” They all agreed: there would not be. As they were learning about poetry, these 16- and 17-year-old students in New York City were learning the beautiful and just way of seeing the world every person needs, and has a right to learn. In the final line of “Strange Meeting,” after having one man describe how he was killed by the other, Owen joins them for the first time, with the pronoun ‘us’: “Let us sleep now.” I was moved to see the deep attention and respect in these students—including several who had sometimes acted sleepy or disinterested. I respect them very much for the way they wanted to speak about and understand this poem, and the strikingly beautiful way it makes of one of sameness and difference. Darren Williams is one person who changed dramatically after this lesson. He was in my first period class and usually came late. Darren had difficulty reading and writing, and rarely finished any of the required class work or homework. I knew he was very ashamed of this. He had a far-away look, and rarely said anything in class. He sat in the back, sometimes dozing off. But in this class, Darren came alive. When he heard Eli Siegel’s description of contempt, and Aesthetic Realism’s seeing it as the cause of prejudice, he sat up and was alert in a way I had never seen him be. When I asked questions of the whole class, he responded. He even raised his hand to answer a question, something he hadn’t done before. Later that week, Darren did something that affected me very much. I had assigned an essay about a character in the novel we had been studying. For the first time, Darren handed in a complete paper. He wrote thoughtfully and seriously about the character, including where he had contempt for people. Usually, Darren would slip his incomplete paper under the others on his way out; this time, he handed it to me, clearly proud of what he had written. As an English teacher, I am enormously grateful for Aesthetic Realism’s explanation of poetry and its understanding of the feelings of people. Teachers and students need to be able to study this glorious and needed fact: art has the justice we are looking for. To learn more about the Aesthetic Realism Teaching Method, and to inquire about professional development workshops, visit the website of the Aesthetic Realism Foundation: http://aestheticrealism.org. *Note: The students’ names were changed. Owen, Wilfred. “Strange Meeting.” The Norton Anthology of Poetry. Ferguson, Margaret, Mary Jo Salter and John Stallworthy. New York, W.W. Norton & Company, 1996. Siegel, Eli. “Assonance Is Like This.” New York Quarterly #2, Spring, 1970: 82-90. —Four Statements of Aesthetic Realism. New York: Aesthetic Realism Foundation, 1967. —“The Immediate Need for Poetry.” The Right of Aesthetic Realism to Be Known, #758, 14 Oct. 1987.